I really like the front cover of Perfect Piggies by Sandra Boynton. A cute, pink pig stares out from the cover. The pig’s nose is open so that the second page of the book shows through. The small slit is a fantastic design element that draws attention to the pig and the pink-on-pink color scheme. Whenever I like the front cover of a baby book, Arya usually likes the book itself. Baby books with well-designed front covers generally have the same attention-grabbing illustrations and color schemes inside. 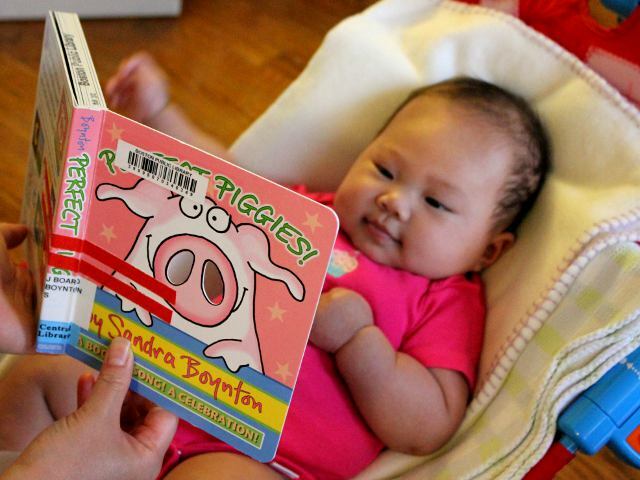 While my baby tolerated a full reading through the book, she didn’t like Perfect Piggies as much as some of her favorite books. The cover of Perfect Piggies is great because of the huge pig dominating the page. Unfortunately, most of the interior pages have much smaller pictures with some having multiple scenes per page. Given the already tiny size of a baby book, cramming two distinct pictures and text into one page bores little readers. My baby enjoys one huge illustration with a few easy words per page. Some of Perfect Piggies’ pages fit the description, but others are too busy and lack the single point of attention which captivates Arya. Arya did like staring at the large-scale pictures like the piggies on green pogo sticks. If all of the pages contained the same design of one large picture per page, I suspect Perfect Piggies might have been one of her favorites. My daughter also liked the song that accompanies the book. The inside front cover has a URL to the song download page. Perfect Piggies has a cute story and fun illustrations. Hopefully as Arya gets a little older she will like reading it even more. For now we are going to focus on reading baby books with huge illustrations and high-contrast color schemes. The author/illustrator of Perfect Piggies — Sandra Boynton — has written and illustrated more than 40 children’s books. Boynton’s official website contains very little useful information and is hard to navigate. Six identical buttons saying “Tell Me More!” lead to drastically different pages. More useful information on Boynton and her books is available through Wikipedia. Perfect Piggies costs (including shipping) $6.95 new and under $4 used from Amazon.